Start Small: procrastination didn’t win! So bright! So spring! My mom always finds the coolest fabrics. I didn’t do anything with either project until Saturday. Nothing at all beyond the thinking stages. It was one of those weeks where it was really easy to let everything else take priority. But other than doing dishes, it was all good stuff. I spent every day after work playing in the yard with my baby. That was especially fun since she likes barking at the neighbor’s dog. I also caught up on a bit of reading I had been wanting to get to. That is the joy of having small projects on your plate — you aren’t adding stress to a week that already has enough. A great illustration of why you should shoot in daylight, not fakelight. But about my complete small projects. At the top of the post you can see the very cool dress my mom made for my little lady. She couldn’t find buttons that were quite right, so she left that up to me. 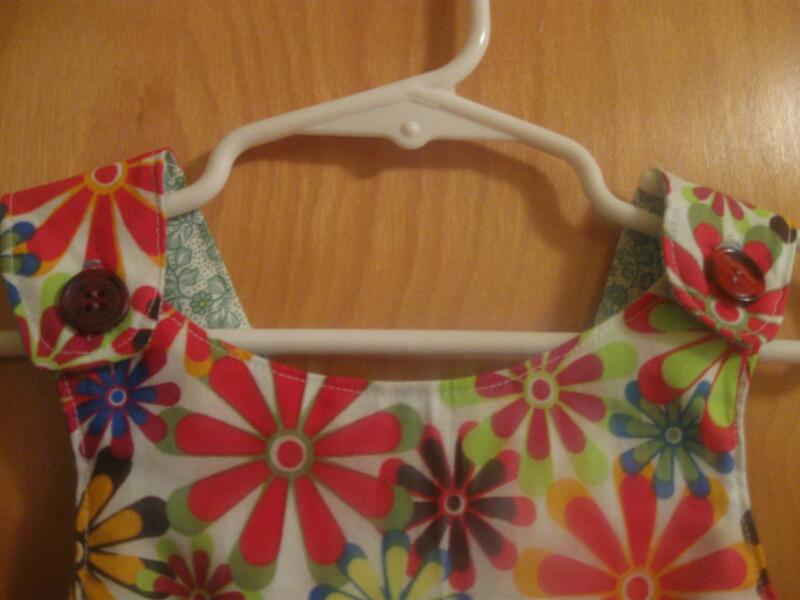 Since the dress is reversible, I had to use flat buttons. The ones I chose aren’t a true match, but they are close to the same burgundy color. The dress is still a bit large on her, but that is fine as it is still a bit cool here. By the time it gets really hot, it will be perfect. Oh, a sidenote on today’s photography. I am not shaky, and I don’t own the world’s worst camera. The blur on all these shots is due to taking pictures of a pudding-covered baby. One who poked her pudding fingers on the lens. Since all my glass cleaner is at work, I get to work with what I will call “pudding blur”. Making those little rosettes is addicting. 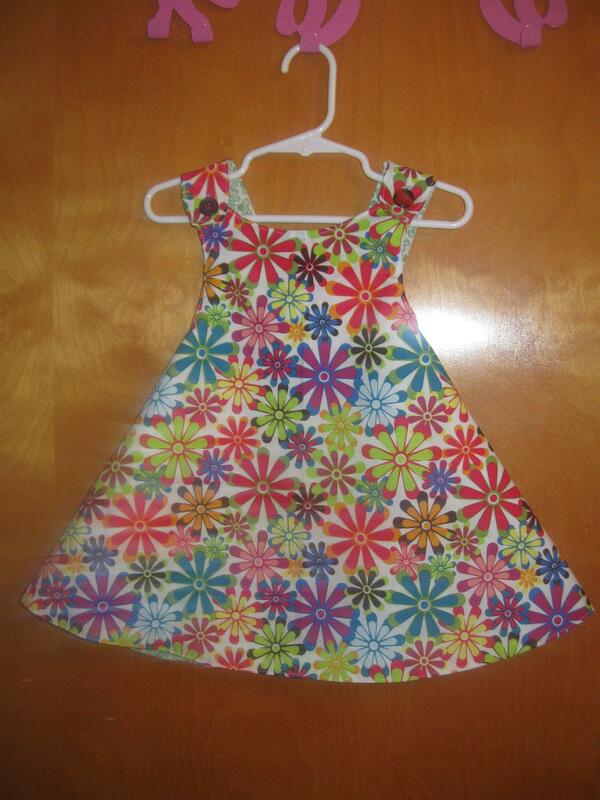 And a great way to use scraps of fabric. My other projects for the week was a birthday gift for one of my tiny friends. After some waffling, I asked her mom if she liked headbands. I got a pretty enthusiastic response, which made the decision so much easier. 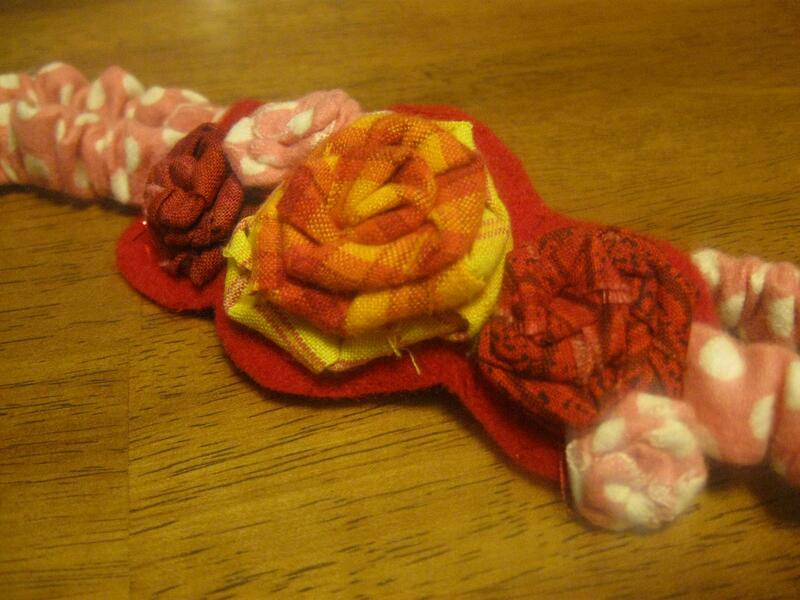 So I made some fabric rosettes and created a headband inspired by one I has seen on Sew Hip Mama. I used a base of red and pink, but I really feel that one kick of yellow kept it from being too little kiddish. The combination of pudding blur and fluorescent lighting really aren’t doing it justice. But that is the price I pay for delaying crafting. I lost all that wonderful sunlight that makes crafts look so darn good. I still have zero idea what I am going to do for this coming week’s Start Small. But I will go over my list tonight and see what I can come up with. I may also need to get the ball rolling on some bigger projects as well. We will see what I come up with tomorrow. Enjoy the last few hours of your weekend!